Grooming the dog is a top priority for many dog owners but one area that is sometimes not given sufficient attention is the mouth – specifically the dog’s teeth. We all know that if we don’t look after our own teeth we can develop cavities, dental decay and other health issues. Dogs are exactly the same in this regard and, just as in humans, dental decay can cause pain, tooth loss, and can negatively impact the health of other organs such as the heart, lungs, and kidneys. 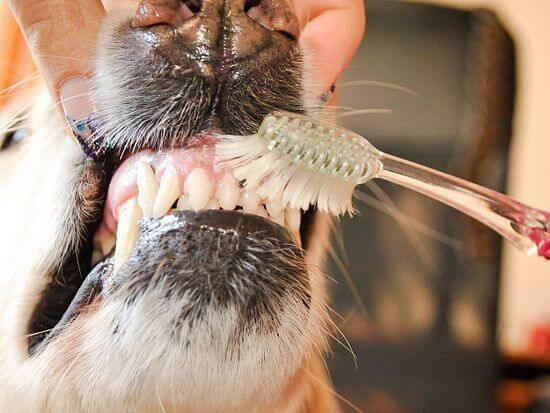 Ideally, brushing your dog’s teeth should be part of your daily routine just like your own. You’ll want to use a specially formulated doggy toothpaste as human toothpaste contains fluoride which is toxic to dogs. One thing for humans you can use is a regular, soft bristle toothbrush. If your dog cannot tolerate the use of a normal toothbrush, using a small finger brush can be a good option. Ensure that you brush all tooth surfaces and gums using light circular motions as you would when brushing your own teeth. In the real world, no matter how much we love our pets and want the best for their health, incorporating daily brushing of their teeth into our hectic schedules often doesn’t happen. There are other ways to keep your dog’s teeth clean and breath fresher in between brushing. One way is to give your dog raw bones (but not chicken bones or cooked bones that can splinter easily), which can be excellent for a dog’s teeth. However, giving a dog a bone is controversial as demonstrated in an article by T. J. Dunn, Jr., DVM on PetMD,1 which highlights the other health dangers to your pet that can outweigh the dental health benefits. Dental treats can be used as an alternative to regular treats. Be careful of weight gain in your pet if using these, as some are quite high in calories. 60% of a dog’s tooth lies below the gum line so even with care at home your dog may still require professional dental care. If your dog’s breath smells especially bad, there is plaque still building up around the gums, your dog has bleeding gums or lumps or bumps in the mouth (which could indicate oral cancer), or you have other concerns with your dog’s oral health, you should turn to a veterinarian for assistance.